How to Cite This Chapter: Nath S, Almenawer S, Alhazzani W, Przyjałkowski W, Mrukowicz J. Lumbar Puncture. McMaster Textbook of Internal Medicine. Kraków: Medycyna Praktyczna. 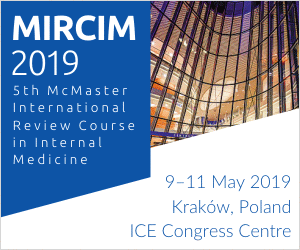 https://empendium.com/mcmtextbook/chapter/B31.IV.24.12 Accessed April 23, 2019. 1) Suspected central nervous system (CNS) infection, particularly meningitis (the key indication for lumbar puncture). 4) Certain types of neuropathy. 5) Suspected subarachnoid hemorrhage in a patient with negative computed tomography (CT) results. 6) Other CNS diseases where cerebrospinal fluid (CSF) examination can be useful for establishing the diagnosis (eg, neoplastic meningitis). 7) Intrathecal administration of a contrast agent. 1) Intrathecal administration of drugs when indicated: Antibiotics for CNS infection, cytotoxic drugs for CNS malignancy, anesthetics. 2) Emergency CSF evacuation in patients with elevated intracranial pressure (ICP) (eg, in communicating hydrocephalus; neurosurgical input needed). 1. Absolute: Cerebral edema or tumor (a tumor not located in the posterior cranial fossa and not causing displacement of planes might be considered a relative contraindication). 2. Relative: Infection of the skin and subcutaneous tissue at the planned puncture site, developmental abnormalities of the spine and spinal cord (eg, dysraphia), coagulation abnormalities (international normalized ratio [INR] >1.5, activated partial thromboplastin time [aPTT] >2 × upper limit of normal, or platelet count <50,000/microL); suspected subarachnoid hemorrhage (in such cases perform CT of the head before lumbar puncture). 1) Postural headache that develops 24 to 48 hours following lumbar puncture, most frequently in the frontal or occipital area. It can be accompanied by nausea, vomiting, dizziness, tinnitus, visual disturbances, and signs suggestive of meningitis. The headache improves spontaneously within 1 to 2 days (occasionally it may take several weeks to resolve). Prevention: Use a smaller-bore needle (eg, 22-gauge instead of 18-gauge), direct the tip of the needle with its bevel towards the lateral portion of the spine (to make the needle separate the fibers of the dura mater instead of cutting through them), or use a needle that has a blunted, noncutting tip, termed “atraumatic needle.” Bedrest after lumbar puncture or administration of intravenous fluids does not prevent the postpuncture headache.Evidence 1Weak recommendation (downsides likely outweigh benefits, but the balance is close or uncertain; an alternative course of action may be better for some patients). Moderate Quality of Evidence (moderate confidence that we know true effects of the intervention). Quality of Evidence lowered due to risk of bias. Arevalo-Rodriguez I, Ciapponi A, Roqué i Figuls M, Muñoz L, Bonfill Cosp X. Posture and fluids for preventing post-dural puncture headache. Cochrane Database Syst Rev. 2016 Mar 7;3:CD009199. doi: 10.1002/14651858.CD009199.pub3. Review. PubMed PMID: 26950232. Treatment: Bed rest, oral analgesics (acetaminophen [INN paracetamol] with or without caffeine, opioids; do not use nonsteroidal anti-inflammatory drugs or other agents that impair platelet function). In patients that do not improve with drug treatment, epidural blood patching—involving injecting the patient’s venous blood at the puncture site—has been shown to alleviate headache by sealing the dural tear.Evidence 2Weak recommendation (benefits likely outweigh downsides, but the balance is close or uncertain; an alternative course of action may be better for some patients). Low Quality of Evidence (low confidence that we know true effects of the intervention). Quality of Evidence lowered due to imprecision. Boonmak P, Boonmak S. Epidural blood patching for preventing and treating post-dural puncture headache. Cochrane Database Syst Rev. 2010 Jan 20;(1):CD001791. doi: 10.1002/14651858.CD001791.pub2. Review. Update in: Cochrane Database Syst Rev. 2013;11:CD001791. PubMed PMID: 20091522. 2) Back pain at the lumbar puncture site. 3) Radicular pain that is most frequently referred to the lower extremities. The onset of the pain at the time of needle insertion is a sign of nerve root irritation. In such cases, withdraw the needle and change the direction of needle insertion. 2. Other (rare): Paraplegia caused by epidural hematoma (usually seen in patients who have received anticoagulants shortly before or after lumbar puncture); brain herniation into the foramen magnum (in patients with cerebral edema, tumor causing increased ICP, or large subarachnoid hemorrhage; this complication is frequently fatal); subarachnoid and/or subdural hemorrhage; injury to spinal ligaments or the vertebral periosteum; acute bacterial vertebral osteomyelitis; abscess; epidermoid cyst; sixth nerve palsy from a sudden decrease in ICP, which may result in traction of the sixth nerve. 1. Obtain an informed consent from the conscious patient or a substitute decision maker. 2. Assess the platelet count, INR, aPTT, and correct if abnormal. If the patient is treated with anticoagulants, discontinue them (Table 1 in Anticoagulant Treatment and Regional Anesthesia). 3. Exclude elevated ICP (cerebral edema or tumor) on the basis of funduscopy (look for papilledema) or CT of the head. CT should be performed in all patients with a history of immunodeficiency, previous CNS disease, or recent seizure (epilepsy), and patients with papilledema, altered mental status, or focal neurologic signs. 4. Place the patient in the lateral decubitus position, close to the edge of the examination table, with the patient’s back facing you. Lower limbs should be flexed at knees and hips, knees pulled against the abdomen, head at maximum flexion towards the knees (Figure 1). Avoid excessive flexion of the spine; it should form a single line in one plane. The back and shoulders should be aligned in a plane perpendicular to the table. The procedure can also be done in a cooperative patient in a sitting position and under fluoroscopic guidance in a prone position. 1. Equipment for surgical field preparation and optionally for infiltration anesthesia. 2. A sterile single-use lumbar puncture needle with a stylet, 22-gauge or 20-gauge, 8.75 cm in length (if only available, we recommend a newer pencil-point atraumatic needle in place of the traditional cutting-type needle).Evidence 3Strong recommendation (benefits clearly outweigh downsides; right action for all or almost all patients). High Quality of Evidence (high confidence that we know true effects of the intervention). Nath S, Koziarz A, Badhiwala JH, et al. Atraumatic versus conventional lumbar puncture needles: a systematic review and meta-analysis. Lancet. 2018 Mar 24;391(10126):1197-1204. doi: 10.1016/S0140-6736(17)32451-0. Epub 2017 Dec 7. Review. PubMed PMID: 29223694. Optionally, you may use a smaller-bore needle inserted through a shorter larger-bore needle (an introducer needle); such a needle may be required for using an atraumatic needle if skin puncture is found to be difficult. 3. A manometer for CSF pressure measurement. The interspinous space, optimally the L4 and L5 or L3 and L4 but not above the L2 and L3 space to avoid the end of the spinal cord, in the midline passing in-between the spinous processes, slightly laterally to it. The line connecting the most proximal points of the iliac crests should cross the lumbar spine at the level of the L4 spinal process (Figure 1). 1. Prepare the surgical field (see Field Preparation for Small Procedures). If necessary, anesthetize the skin and subcutaneous tissue using a local anesthetic, for instance, EMLA cream or infiltration anesthesia using a 1% lidocaine solution (see Local Infiltration Anesthesia) (not necessary in an unconscious patient). 2. Slowly insert the needle with a stylet, directing it obliquely in the cranial direction and towards the umbilicus. Direct the bevel of the needle upwards, with a trajectory at the midsagittal plane. The puncture of the ligamentum flavum and the dura mater is perceived as loss of resistance accompanied by a “pop” (in adults the subdural space is located at a depth of 4-7 cm). After overcoming the resistance of the dura mater, remove the stylet. The needle is supposed to displace the nerve roots but may rarely irritate one of them. Drops of CSF should appear at the needle tip. If the patient is conscious, ask him or her to relax the lower limbs (reduce hip flexion). If CSF outflow is not seen, replace the stylet and gently advance the needle or turn it by 90 degrees Celsius, then remove the stylet again. Do not apply intense pressure to overcome resistance to the needle. The absence of CSF may be caused by passing the needle beyond the subarachnoid space. Blood-staining of the fluid can result from injury to a spinal canal vein during the procedure; in such cases, CSF often becomes clear after a while. If this is not seen, repeat the lumbar puncture one intervertebral space above or below. 3. For an accurate CSF pressure measurement (not always necessary), hold the needle in one hand and connect the CSF pressure-measurement device using the other hand (a normal pressure range is 7-15 [<20] cm H2O, which usually corresponds to a CSF outflow rate of 20-60 drops per minute; the measurement result is reliable if the patient remains still and relaxed). 4. After measuring CSF pressure, collect the CSF to several sterile tubes for testing (usually 3-5 mL; after excluding cerebral edema, a maximum volume of 40 mL may be collected). 5. Once the CSF is collected, reintroduce the stylet into the needle, withdraw the needle, and protect the skin with a sterile dressing. Complications such as nerve root herniation and post-dural puncture headache may occur with failure to reintroduce the stylet into the needle. Patients are encouraged to ambulate after the procedure when possible. Interpretation of results: see Analysis of Cerebrospinal Fluid. Figure 1. 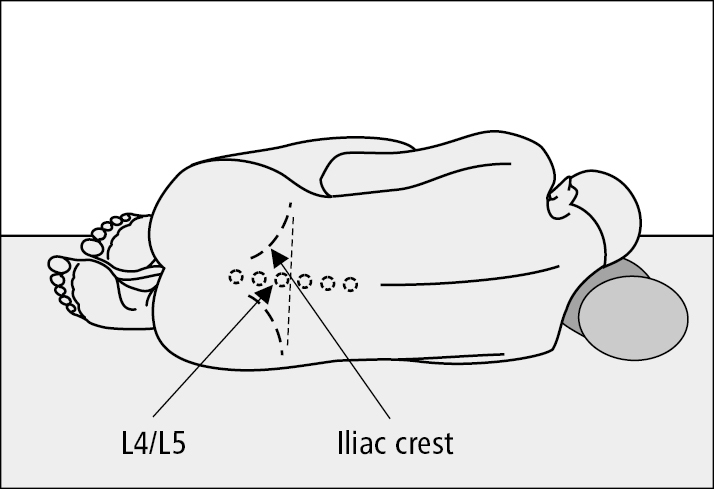 Appropriate patient positioning for lumbar puncture and location of the L4/L5 intercostal space.